Saint Rita Indian Mission - Stained Glass Inc. When considering a memorial for a church, stained glass is the perfect choice. At Stained Glass Inc., our stained glass window panels provide a beautiful, colorful, affordable way to memorialize a passed loved one. 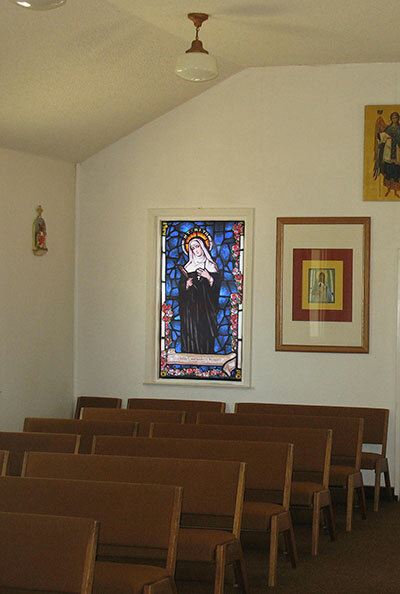 Tom at Saint Rita Church in Orange Cove, CA knew that stained glass was a beautiful and fitting option but had no idea how simple getting it could be. He contacted Stained Glass Inc. and was given all the help he could ever need. All stained glass artwork from Stained Glass Inc. is custom made. Stained Glass Inc. worked with the church to create a custom size and design. It only took four short weeks for the panels to be designed, produced and delivered to Saint Rita Church. Once received, the panels were simple to insert and fit perfectly over the already existing windows.